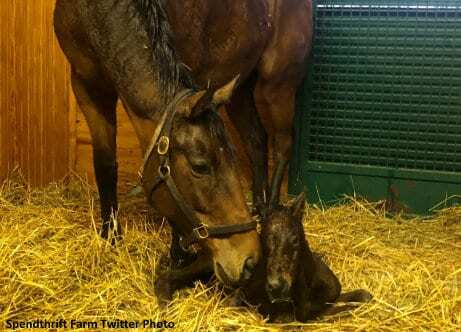 Four-time champion & three-time Breeders' Cup winner Beholder delivered a bay filly by Curlin Saturday afternoon at Spendthrift Farm in Lexington. The filly was born at 4:25pm and “jumped right up” according to Toffey. She's the second foal for Beholder, who had an Uncle Mo colt – now named Q B One – last year. Beholder retired from racing in 2016 after an illustrious career that saw her win 18 of 26 starts with earnings of $6,156,600. She earned Eclipse Awards as the outstanding 2-year-old filly of 2012, 3-year-old filly of 2013, and older filly & mare of 2015 and 2016. Among her 11 Grade 1 victories were three Breeders' Cup triumphs, including the 2012 Juvenile Fillies, 2013 Distaff, and – in dramatic fashion – the 2016 Distaff over Songbird in what would be her final career start before retiring to Spendthrift Farm. Beholder also scored a memorable win in the 2015 Pacific Classic, facing and defeating males in dominating fashion by 8 1/4-lengths at Del Mar. Mating plans for Beholder in 2019 have yet to be finalized, Toffey said. For more information about Beholder, visit www.ChampionBeholder.com. This entry was posted in Bloodstock, NL Article and tagged beholder, Curlin, filly, ned toffey, spendthrift, spendthrift farm by Paulick Report Staff. Bookmark the permalink.